Effective pro-ocean activism is something that everyone who cares about the marine environment can engage in. This is the strong message of the most recent of David Helvarg’s books, Saved by the Sea, and of this short volume, too. It is illustrated by Jim Toomey, creator of Sherman’s Lagoon. Rather than being overwhelmed by ocean-related doom and gloom, there are very simple actions that we can incorporate as part of our everyday lives that have a direct impact on the health of the marine environment. The Two Oceans Aquarium does a great job of speaking about this aspect of responsible citizenship on their blog and on Twitter – you should follow them if this is important to you. Many of the actions that Helvarg suggests entail simply enjoying the marine environment, and this is a profound but familiar idea. When we care about something, we will protect it, and by enjoying the sea through diving, visiting the beach, or riding on a boat, we will come to care about it and its inhabitants. The emphasis in many of the sections is also on safe enjoyment of the ocean. Helvarg does not explain his focus on safety, but one reason I can think of for encouraging careful and safe enjoyment ocean-related activities is to ensure that these activities will remain available to everyone. Bad publicity after marine accidents can drive people away from the beach! 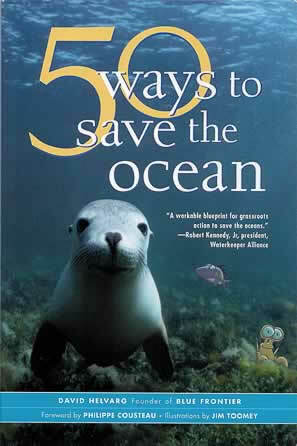 50 Ways to Save the Ocean connects patriotism and pride with care for the environment, which is an excellent approach for robustly patriotic people like Americans. For South Africans, whose feelings towards their country are – for historical reasons – often a little less straightforward than those of your average flag-waving American, this approach may not be the best one. Helvarg also provides the contact details of a large number of US-based organisations that espouse the values he advocates and engage in the kinds of conservation activities he describes. Someone needs to write a version of this book for South Africans! This is the kind of book you could go through with a relatively young child, and decide together which actions you’re going to implement together. The reading level isn’t complex. Get the book here, here or here (if you’re in South Africa). Bernita brought us this book as a gift from her travels in America early this year. It’s published by the Smithsonian Institution, which is an American conglomerate of museums and research institutions. (If you’ve watched Bones, think of the Jeffersonian – which is fictional but based on the Smithsonian – and you’ve got a good idea of what it’s like. I digress.) The book is arranged in question and answer format. The questions are drawn from the thousands of letters, emails and phone calls received from members of the public by the Smithsonian each year. Every aspect of cetacean science is covered here. I appreciated the fact that where there is uncertainty or gaps in our knowledge, the authors said so. Science helps us to know things, but equally important is to recognise what we don’t know. Because they live so long, dive so deep and swim so far in such a big ocean, it is hard to learn some things about whales, but with diligent work and intelligent study design, we can still infer much. 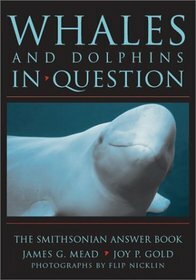 There is another book in the series called Sharks in Question, which has one author in common with Whales in Question, and if this book is anything to go by, should be a wonderful read. You can get a copy of Whales in Question here (South Africa), or here. Thank you Bernita! Earlier this month we hosted a scuba diving birthday party in our pool, for a group of extremely excited eight year olds. It was a slightly chaotic but enormously enjoyable day! 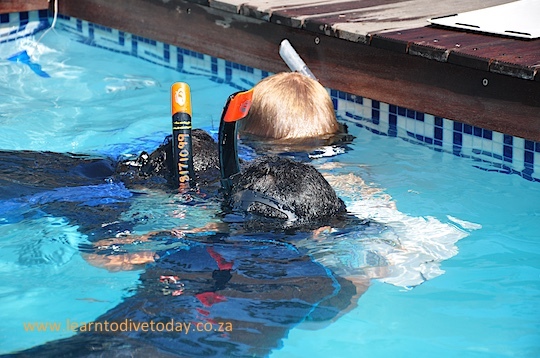 The boys first mastered the use of snorkels, making drawings on slates while submerged. 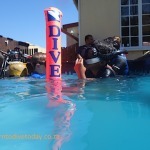 We were impressed by how well they took to skin diving, and they rocketed up and down the pool like sea otters. 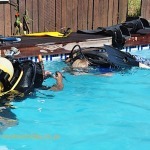 After that they tried out scuba gear, and we were amused by the various ways they found to enjoy themselves. One of the boys kept inflating his BCD because he liked the sound the over-pressure valve made. Another made foamy fountains of water by purging his octo in the shallows. Others seemed to feel like Jacques Cousteau as they explored the pool! We taught them how to inflate an SMB using their spare regulator, and brought out our collection of underwater cameras for them to take innumerable selfies and group portraits that they could take home with them. 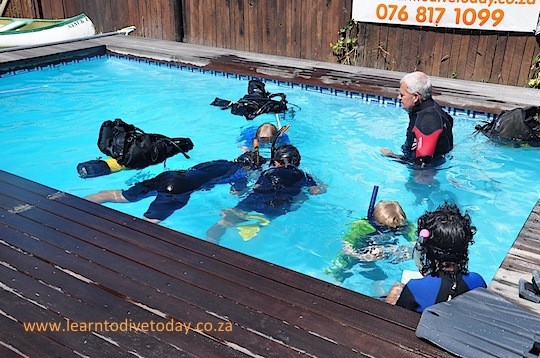 Parties like this are ideal for small groups of four to six participants, as they are supervision-intensive and a small group lets each child fully enjoy their turn to try out scuba gear under the supervision of the instructor. A little bit of advance planning is recommended for the purposes of paperwork, so get in touch sooner rather than later if you think this is something your child might enjoy. We can conduct the event in your swimming pool at home if it’s less than two metres deep, or at our pool. We have conducted a similar event at the Virgin Active gym, but that requires special permission. Be warned, the scuba diving bug might bite! The PADI Bubblemakers and Seal Team programs are designed for kids aged 8-10, and enable them to master the use of scuba gear in the swimming pool. You can read more about those programs on the PADI website. From the age of 10, children can obtain a Junior Open Water qualification, which upgrades to a full Open Water qualification when they turn 15. I’ve carefully chosen these photos so you can’t identify the kids, hence their mixed quality! The big kid with the silver hair is Tony. If you watched yesterday’s freediving documentary, “No Limits”, you may enjoy this talk by Tanya Streeter, a (now retired) British/Caymanian freediver who features in that film. She gave a talk at TEDxAustin in 2012. In it she talks about the sport of freediving, gas narcosis, motherhood, and plastic pollution in the world’s oceans. 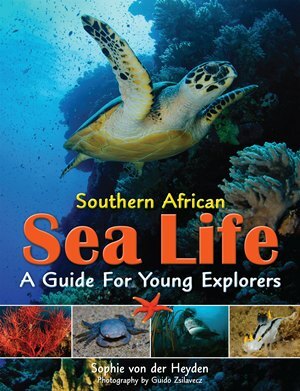 Marine biologist and geneticist Sophie von der Heyden has produced a beautiful, practical and useful book for young people wanting to know more about the life found in Southern African coastal waters. Von der Heyden provides information about the different species found on the coast, along with tips on how to spot them, and what gear to take along to the beach for a day of exploration. Care is taken to advise young fishermen how to handle fish (gently) and when to put them back in their rockpools (quickly). The book’s many photographs were mostly provided by Guido Zsilavecz of SURG, author of two of our favourite nudibranch and local fish identification books. There are images of the marine life as well as the habitats in which it is found, both large and fine scale. The book’s design and layout are varied and colourful, which makes it a pleasure to page through and a source of inspiration for rockpool exploration. I appreciated the book’s fair treatment of our entire coastline. It is tempting to view the coral reefs of Sodwana and Durban as more romantic and visually striking than the dense carpet of invertebrate life that characterises the Cape’s waters, but the interested explorer is rewarded in both areas. Children’s books about coral reefs are not unusual, but a book that teaches appreciation of the abundance of life along the south western Cape coast is a rare thing indeed. You can get a copy of this book here. In a couple of years’ time it’ll be on my niece and nephew’s Christmas list! Friday: Roman Rock and Photographer’s Reef , and a night dive at Long Beach. Text me before 10am on Friday if you want to do the night dive. 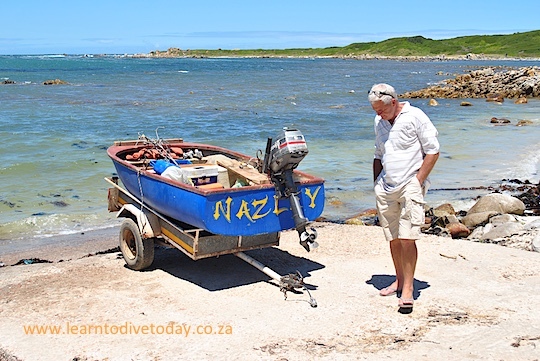 We were boatless last week so could do shore dives only, but by Friday the boat was back after repontooning. 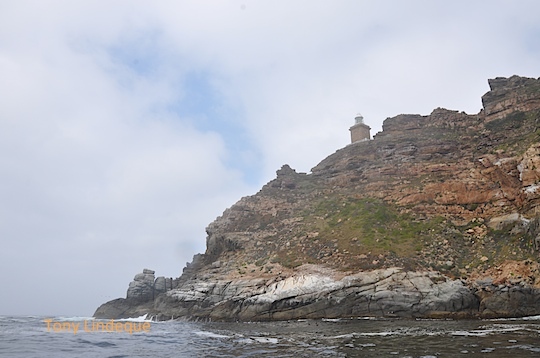 This week we have been blown out most days, but today we headed off to Diaz Beach inside the Cape Point Nature Reserve with a group of very tough and brave swimmers that swam from Diaz Beach to Buffels Bay, a distance of approximately 8 kilometres around the tip of Cape Point. The swim was called Swim for Hope and was in aid of the Little Fighters Cancer Trust. 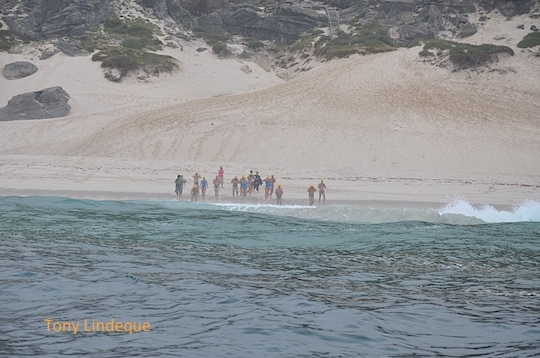 Each swimmer had a support boat and each boat had a shark shield, but there was nothing to shield them from the cold or the huge shore-break they faced at the start. Once round the Point the wind eased and the swell dropped and it was far better. Our swimmer, 61 year old Richard Child, swam tirelessly and had nothing more than a few swigs of hot chocolate on the way. He started with a stroke rate of 70 strokes per minute and ended on 68. Very impressive. Tomorrow is a good westerly wind, this will improve the viz inshore so we will do two dives tomorrow from the boat and then a night dive at Long Beach. There is a fair swell this weekend so I think Long Beach would be the best option . Saturday we launch again but it will be really early as the wind is set to pump from midday. On Sunday we are staying home while 35,000 very energetic cyclists compete for space on the peninsula road network. On Monday we are also launching, and the first dive has not yet been decided (if you book first you get to choose!) but after lunch we will run down to Pyramid Rock to see the cowsharks. 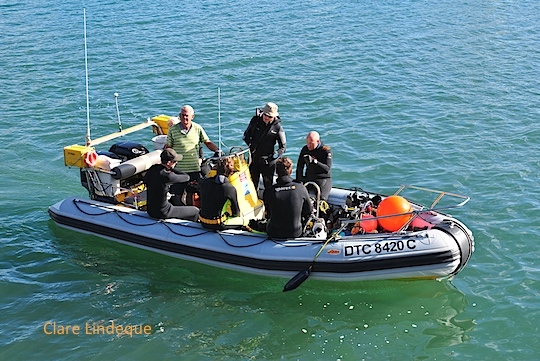 Currently busy with Open Water, Enriched Air, Rescue and Divemaster. The Sodwana trip is creeping up on us – twelve of us will head off for some warm water on the 26th of April. Are you looking for a way to keep your family busy during the school holidays? Do you enjoy being outdoors and exploring the beautiful environment around us? Would your child benefit from the sense of achievement that comes from mastering a new set of skills, and the enjoyment that comes from spending time in the ocean? If you answered yes to any of the above questions, read on! It is a little known fact that children as young as 10 years old can qualify as scuba divers, allowing them to dive with a certified adult diver or scuba instructor. It’s often easier for children to learn the new skills that are associated with scuba diving, because they listen and imitate well, they usually don’t have a lot of built-in hang ups and fears, and it’s really exciting for them to be learning something new. 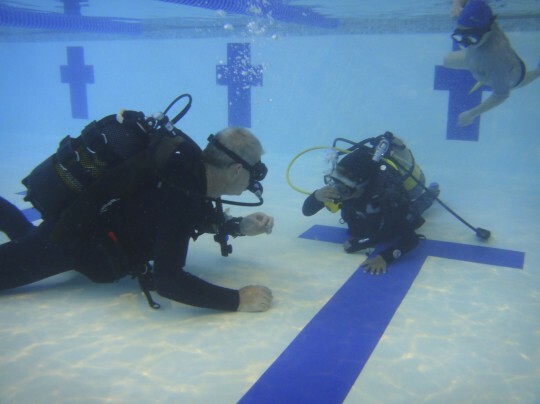 Kids aged 8-9 are too young to become certified divers, but there is a choice of programs available that allow them to experience breathing underwater in the safe, controlled environment of a swimming pool. 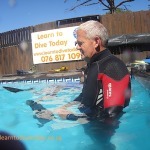 If the bug bites, they can complete the course to become fully qualified Junior Open Water divers once they turn 10. Scuba diving is a great activity for the family to do together – I have taught family groups comprising parents and children, and it’s always a lot of fun. Alternatively, if your kids are keen to dive but you would rather sunbathe on the beach or go for a run with the dogs, that’s also fine! 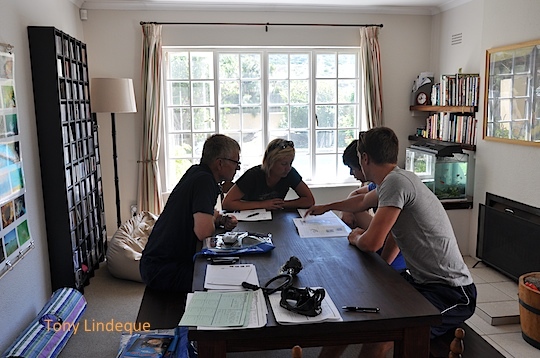 I conduct childrens’ dive course with a high ratio of supervisors (Instructors and Divemasters) to participants. The confined-water (swimming pool) part of all our dive courses is conducted at our pool in Sun Valley, and the sea dives (for courses with participants age 10+) are usually conducted from Long Beach in Simon’s Town, and off our boat, Seahorse, launching from False Bay Yacht Club or Hout Bay depending on the weather conditions. The PADI Bubblemakers and and SDI Future Buddies programs are for kids aged eight and up, and introduce scuba diving in a swimming pool environment. The PADI Seal Team program is available for the same age group, and involve some basic scuba skills and underwater missions to further increase diving competence. 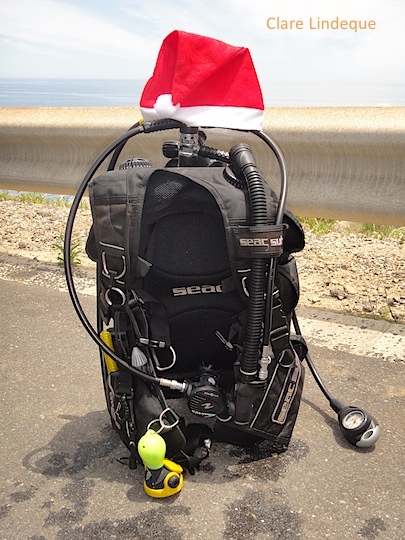 SDI Junior Open Water or PADI Junior Open Water course is for wannabe divers aged 10 and up. 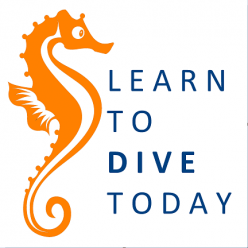 These courses qualify kids to dive to 12 metres while with a certified adult diver or instructor, and when they turn 15 it is possible to upgrade to a regular Open Water qualification. From the age of 12, youngsters can earn the PADI Junior Advanced Diver (qualifying them to dive to 21 metres while with a certified adult diver) and Junior Rescue Diver qualifications.